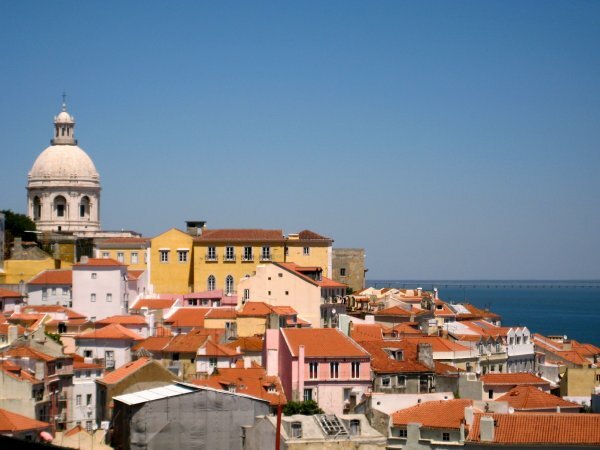 Cruise the coastline of Spain and Portugal and see the fabulous history and culture of Granada, Ronda, Gibraltar, Seville, Jrex de la Frontera, the Algarve and Lisbon aboard the casual S/C Panorama II. 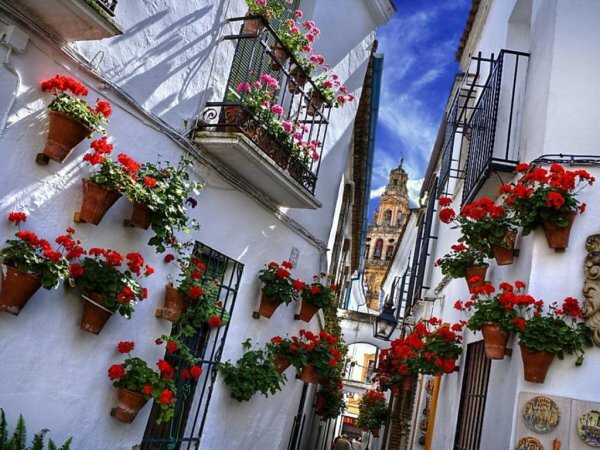 Experience a harmonious balance between conventional cruising and private yachting, along with an exciting voyage of discovery, unravelling the wonders of southern Spain and Portugal. 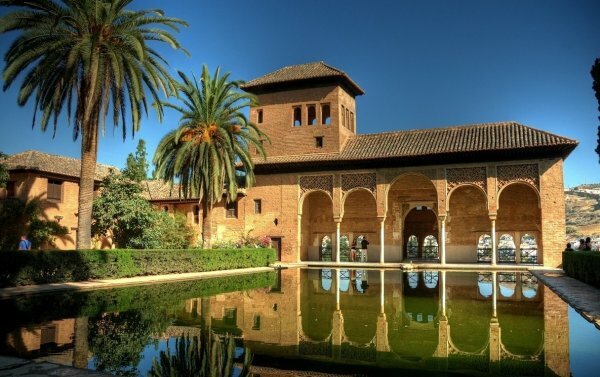 Each day you will discover a new port of call, a glimpse of ancient history to amaze you and rich cultural diversity to intrigue you. 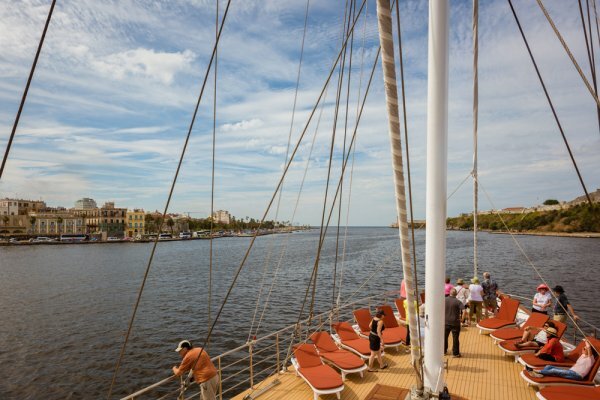 Cruise with only 40 fellow passengers - you'll almost feel like you're on your own private motoryacht! ; enjoy nights in port where you are free to enjoy the local tavernas; an early morning coffee on the forward deck watching the sun rise; swim from the back deck. The Panorama II is a 50 metre Motor Sailer which complies with the latest SOLAS regulations for International Voyages. Her state of the art twin stabilizers allow for safe and comfortable cruising. The two masted M/S Panorama II was launched in 2004 and carries just 49 passengers. This state of the art Motorsailer has performed several Atlantic Ocean crossings, has sailed from the Seychelles to Monte Carlo and from the Black Sea to Tunis and offers a high standard of accommodation, comfort and safety. The public areas include a main bar and lounge which was renovated in 2015 to feature wood flooring and new furniture and comfortable sofas with soft fabrics in warm coral tones. During the day, life on board centers around the indoor Lounge area, and the indoor dining room, as well as the open and inviting deck areas, natural gathering places, perfect for enjoying your meals al fresco, settling into a chair with a good book, or gather with your fellow passengers and enjoy the views of the places you visit. The swimming platform on PANORAMA II’s stern enables you to swim off the yacht when weather and anchorage conditions permit. 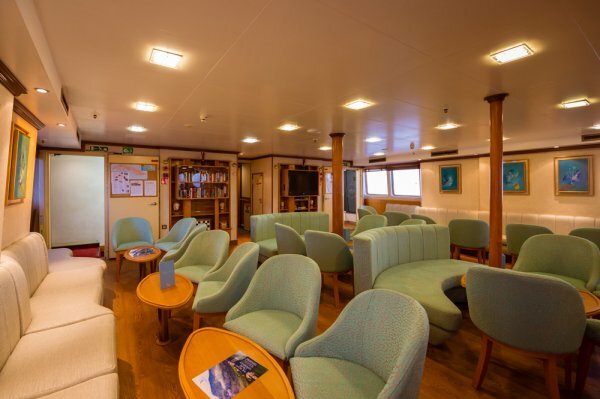 The main lounge, with comfortable sofas, has a full-service bar and a plasma screen, and is the hub of social activities, such as the daily briefings on the destinations visited, and other gatherings. This area is ideal for enjoying the company of your fellow travelers or simply for reading a good book from the library. The area was beautifully renovated in 2015 to feature wood flooring and new furniture and comfortable sofas with soft fabrics in warm coral tones. 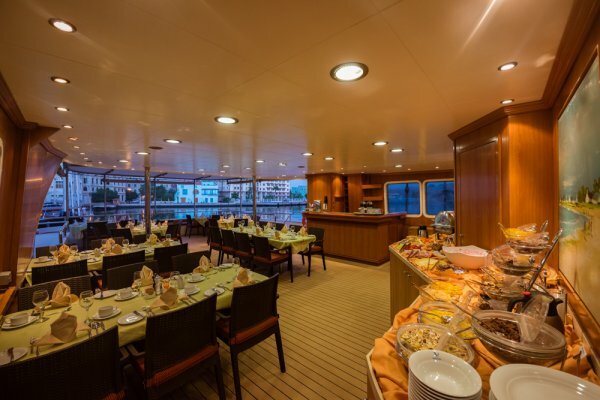 Located on the Lower deck, the indoor dining room seat all passengers in a single, unassigned seating and offer generous buffet space. The aft area at the Upper Deck provides generous semi-covered area where guests can enjoy meals al fresco in a single unassigned seating, with wonderful views, weather permitting. Unassigned seating allows easy mingling and the joy of sharing breakfast, lunch, or dinner with different new friends. Food is served at the table or displayed on the state of the art hot & cold buffets, also including a “a la minute" cooking station. The menu is international, with a focus on local specialties. The bow area at the Upper deck provides generous space and comfortable sun loungers are available to sunbathe in total comfort.